So, yeah, crits appreciated. It's 8 colors, not counting transparency. And yes, I know that black outlines are a sin, but then again, he is a demon. I think right off the bat you're just burning through colors. You can probably limit the colors to 6 or 4 with no problems. Figured the eyes could use a little bit of expression. Black lines aren't a sin, in fact I think it's very useful. Though you need to know when to use it. Some people, you, use it everywhere. Without heavily altering the palette you don't have much else of a choice. I think the flame would look better with out black lines. I think there are two pixel artist you should look at who hardly ever use black lines, all their lines are implied really. Mozzy and Tocky are the only two that come to mind. I don't like pure black myself so I added a little red. Could've made it into any dark color other than green and it would've worked well. Hope my half asleep mumbling and murmurings helped you out. Keep at this and pixel art in general and you should be fine. You'll be surprised how much you can learn from a single piece or pixel art. So, I tried to cut a few colors out. I'm down to 6, plus transparency. I adjusted the shading on his leg, looking at your example, and changed the leg around. I think it looks a little more dynamic now, and changed the black to a dark blue-ish, for the hell of it. Hello FishyBoy, welcome to pixelation. I hope you have a good stay here and learn much (and we learn from you!). I like your little fellow there but I think you don't push the concept enough. I think that is because you think too much of the pixels while pixeling. If you ask me, when doing pixelart you must not think about pixels at all. Please let me elaborate. When you do pixelart, you should have an idea which is medium independent (in this case pixelart). That means, the idea has a infinite resolution and a infinite amount of colors. This image exists just in your brain. When doing pixelart, you can think of downsampling and colorquantisize your idea to match a specific restriction (technically speaking). 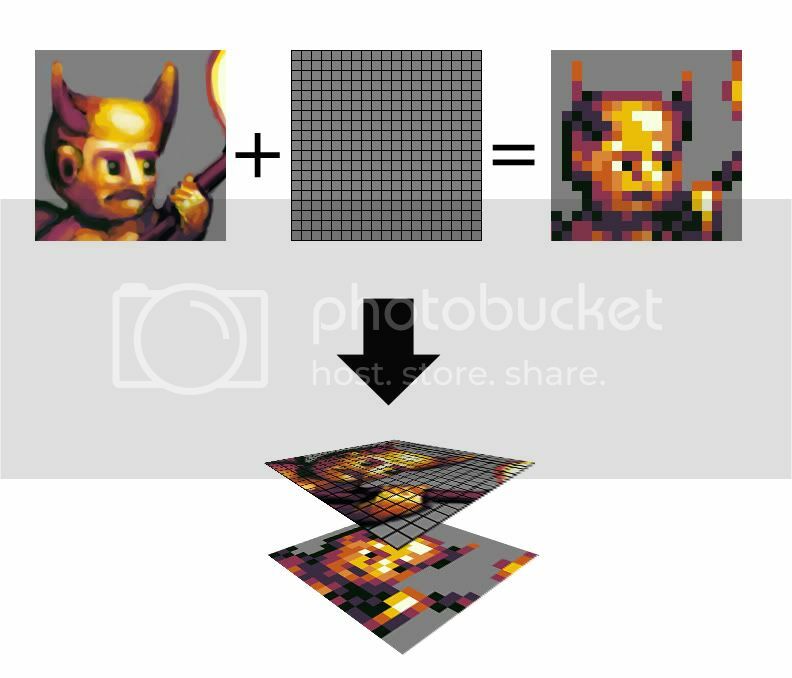 In the following example I have a vague idea and want to make a pixelart with a resolution of 32x48px and 8 colors. Now, when pixeling, I always have the idea in mind (higher resolution than the actual pixelart) and adjust the pixels to match the idea as close as possible. Think of a grid layed over a highers picture and fill the cell with the closest possible color from your palette. Without thinking in higher resolution than your actual workpiece you just shift around giant, full-opaque squares in the hope to generate a nice looking image. That is also the reason why a good pixelartist must have decent traditional skills (e.g. anatomy, perspective). In pixelart, all these things are the same (more or less) and you just use some techniques (e.g. color-conservation, antialiasing, dither, special outline-treatment) to resample/colorquantisize your highresolution idea. In your case I encourage you to stop for a second and think about what you want to display at another resolution. Make some pencil drawings or simple paintings to explore the color spaces. At this stage I think simply shifting pixels and colors around won't make the piece much better. The problem is at a higher resolution than your acual pixelpiece imho. This critique, it is gold. that is the freaking cool critiques and now, i know how to do !